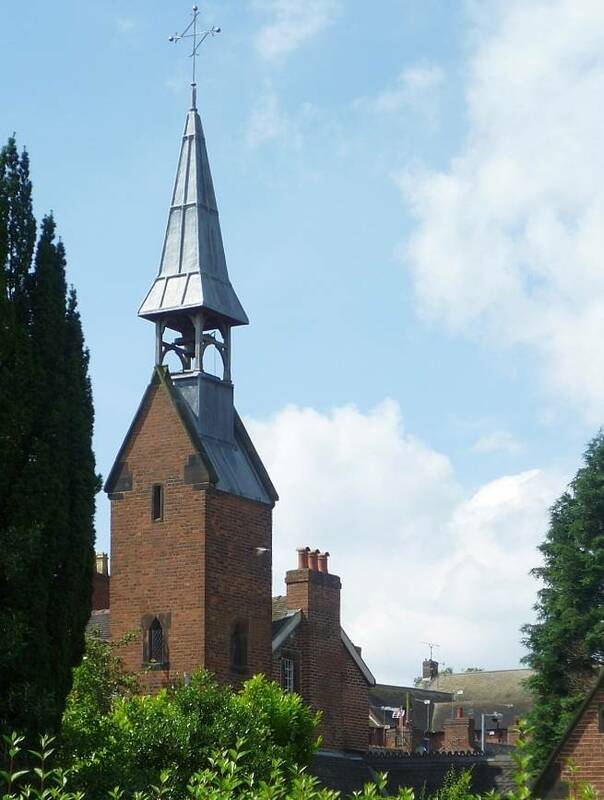 St Joseph's Convent, Bank Street, Cheadle, by A. W. N. Pugin (1812-1852). Left, seen from St. Giles's churchyard. The square tower of the Anglican St Giles can be seen in the distance, to the right of, and lower than, the convent's belfry. Right: Close up of the bell tower. 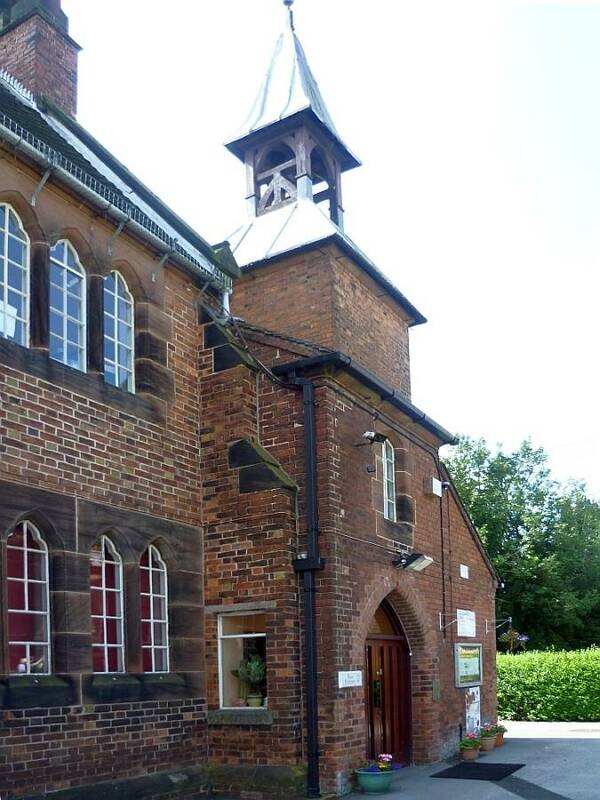 This Grade II listed building stands next to St Giles', Cheadle, and was completed in 1848. 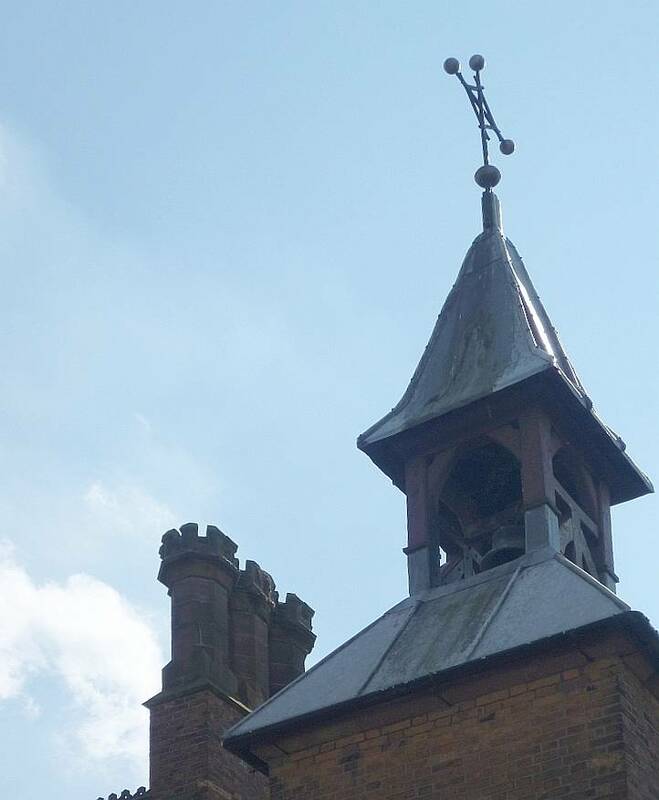 Along with a school just to the rear, which Pugin also designed, this attractive red-brick building expresses "the social and educational dimensions of the Catholic Faith" (Fisher 216). 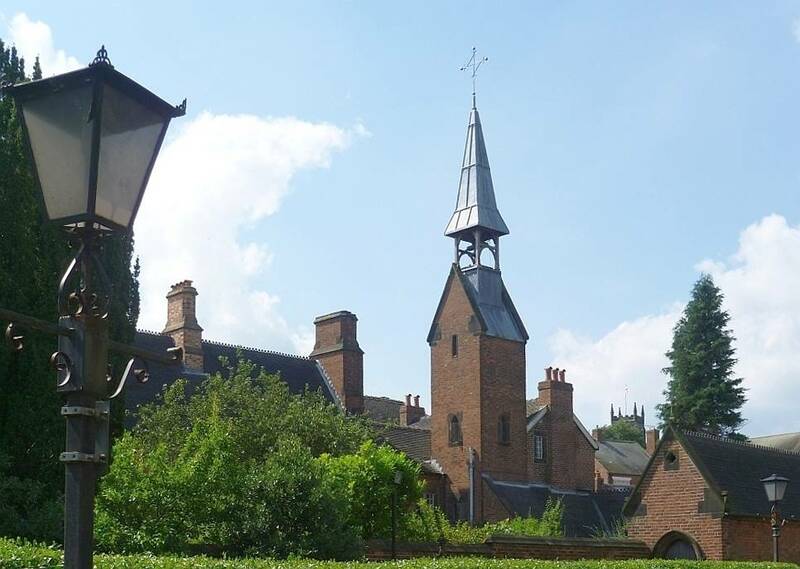 According to the listing text, in the case of the convent, Pugin was working with a late eighteenth-century house which he greatly extended towards the road and the church. The side next to the churchyard is described here as having an east return "continuing into a long blind range flanking the churchyard." The text adds that "a two-storey, four-window range by Pugin" is "attached to the street front by a tall square steeply gabled tower." Until 1875, the convent was occupied by a community of Sisters of Mercy who worked in the school and ministered in the parish. Left to right: (a) The School from the south side of the church. (b) The school entrance. (c) The school bell-tower. The school was completed before the convent, in 1846. It is also brick-built, with a shorter tower and similarly pyramidal and lead-roofed belfry. Nikolaus Pevsner describes the building as "very typical of Pugin in its combination of a picturesque asymmetrical front and a frankly utilitarian back wing with buttresses and regular fenestration." As he says, the turret is "very Pugin too" (97). Pugin himself thought that the school "improves the church & forms a grand mass of building" (qtd. in Fisher 216). There was also a presbytery opposite the church, "a remodelling of an existing building" (Hill 505), now, like the convent, in private hands. The point was to serve the whole Catholic community here. The church was at the heart of it, but its spirit was to spread out to, and become a part of, the daily life of the people. The tall and rather elaborate cross designed by Pugin near the south porch of St Giles'. Nor was death to be forgotten. Pugin believed in treating the dead with due dignity, and the cross he designed for the churchyard serves as a traditional marker of consecrated ground. Itself a Grade II listed structure, it has steps leading up to a base with chalices receiving water (representative of the blood shed for sinners by Christ), and carved symbols of the four Evangelists. 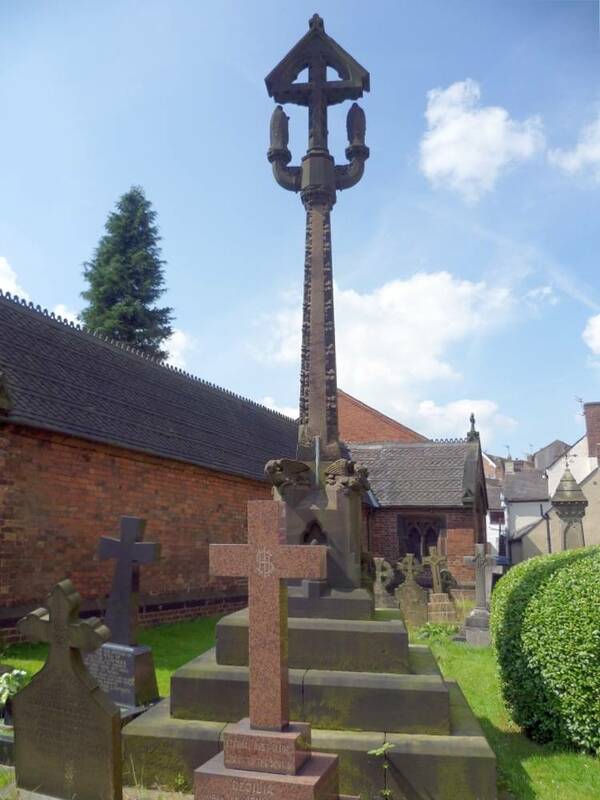 The shaft is crocketed, and at the top, beside the crucifix itself, supports the figures of the Virgin Mary and St John the Evangelist (see Noszlopy and Waterhouse 215-16). The dream of serving a flourishing and harmonious Catholic community proved hard to realise: the first priest appointed here was more enthusiastic about horses than his parishioners, and was eventually dismissed, while the Earl of Shrewsbury's death in 1852 deprived the church of its principal patron. It is a testimony to the power of Pugin's own vision that the church and its associated buildings have been recognised as well worth preserving over the years. "Cross Approximately 10 Metres to West of Tower...." British Listed Buildings. Web. 3 December 2012. Noszlopy, George T., and Fiona Waterhouse. Public Sculpture of Staffordshire and the Black Country. Liverpool: Liverpool University Press, 2005. Print. Pevsner, Nikolaus. Staffordshire. Buildings of England series. London: Penguin, 1974. Print. 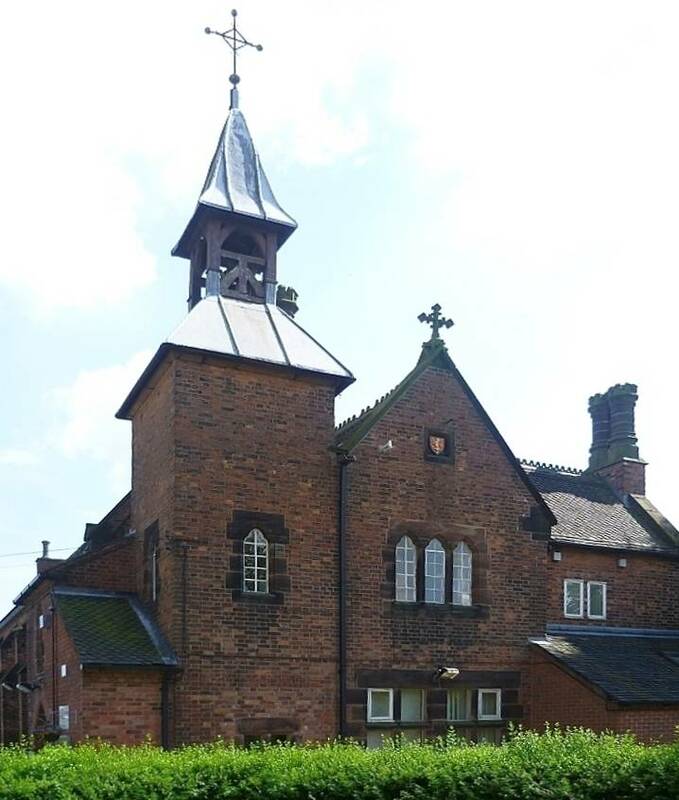 "Convent of St Joseph, Cheadle." British Listed Buildings. Web. 3 December 2012.